Add Some Spring To Your Step! It’s time to get rid of the winter blues and shake up your workout routine! I know I’ve been sick of running on a stationary piece of a equipment, whether it’s the treadmill or the elliptical. With spring comes (hopefully) some warmer weather and milder winds, and I’m ready to take my workouts outside! If you continue to do the same workouts, not only do YOU get bored – so does your body. And with boredom comes little change and a whole lot of untapped potential. Even though I switch up which machines I use regularly, I tend to get bored of the same old gym routine and I feel my body becoming acclimated to what once seemed to be a tough limit. Muscle confusion allows for better results, since your muscles are being continuously pushed to their limits and forced to learn new movements. Also, switching up your gym routine allows your nervous system (your brain, spinal cord and the neurons and other nervous cells throughout your body) to form new connections, which has major implications in the prevention of both physical and mental diseases. So, if you’re getting bored, chances are, so are your legs – time to hit the road and take things outside! So Now, What Do I Do? 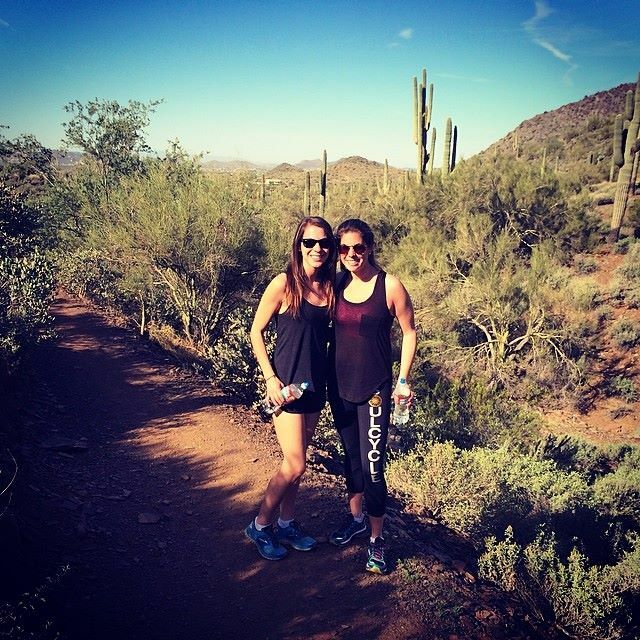 One way I was able to start switching up my workout routine was by hiking this past week, while I was in Arizona with my family. Not only were the views incredible, the burn was, too! 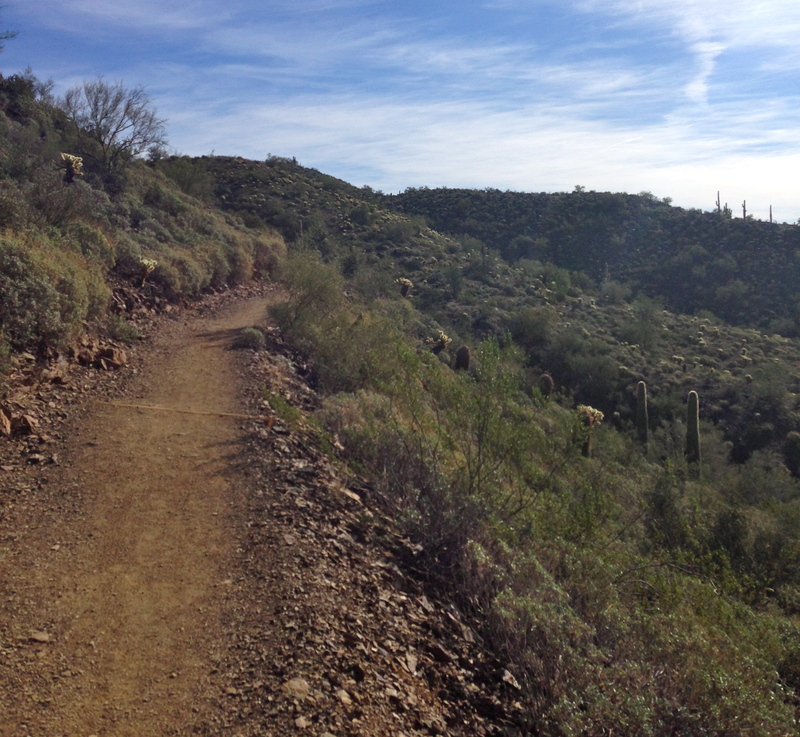 My family and I hiked through Cave Creek and had a lot of fun while doing so. Overall, the trail was only about 3 miles, however, we reached some impressive elevations and certainly felt the incline in our steps. Even though some family members were apprehensive about the hike, everyone ended up having a really great time and now we are searching for places where we can hike while back home in the Connecticut and New York areas. I recommend finding a serene route near you and soaking up the tranquility nature can offer you – especially while being active! My sister and me, stopping for a quick photo op! 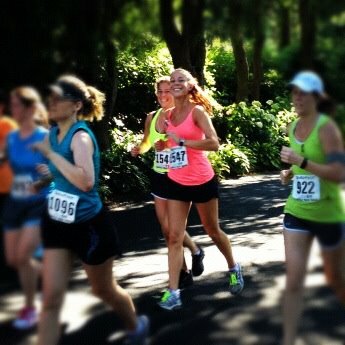 Other ways in which I’m looking forward to switching up my workout? I want to get back on the court and pick up my old tennis racquet. I used to play tennis when I was younger and it was an activity I really enjoyed. Even though it’s certainly a workout, I always looked at it as something I wanted to do for fun, as opposed to something I had to do to stay in shape. This outlook is, in my opinion, what separates those who lead active lives from those who lead sedentary lives with scheduled spurts of activity built in to them. Finding something you love, whether it’s hiking, running, playing tennis, soccer, flag football, or any other activity or sport, is truly the key to sticking with your workout regimen, preventing boredom and progressing. Also, with the nice weather coming, I definitely don’t want to be spending time indoors when I don’t have to! I always feel a sense of clarity and – most importantly – FUN – when I take my workout outside and take in what nature has to offer. And Remember To Always Challenge Yourself! Goin’ strong during the half! In case you couldn’t tell, I’m on a cruciferous veggie kick. I try to eat seasonally when possible and cruciferous vegetables can grow throughout the cool, winter months. Also, cruciferous veggies offer a ton of health benefits and some studies suggest that increased intake of these veggies may be associated with a reduced risk of developing certain cancers.This sweet side dish is like wellness in a bowl – walnuts are rich in omega 3 fatty acids, which reduce inflammation, and pomegranate arils are rich in antioxidants. Make sure you make extra – you’ll want the leftovers the next day! 2. Wash Brussels sprouts and dry thoroughly with paper towel. Cut the Brussels sprouts in halves or quarters, depending on the size of the Brussels sprouts. 3. 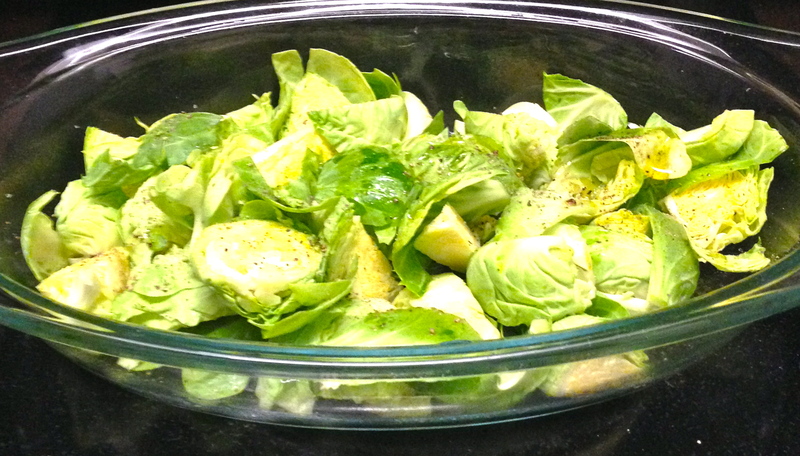 Place Brussels sprouts on baking pan or in casserole dish. Drizzle olive oil over Brussels sprouts and season with salt and pepper. 4. Bake Brussels sprouts in oven for 10-15 minutes, stirring occasionally. 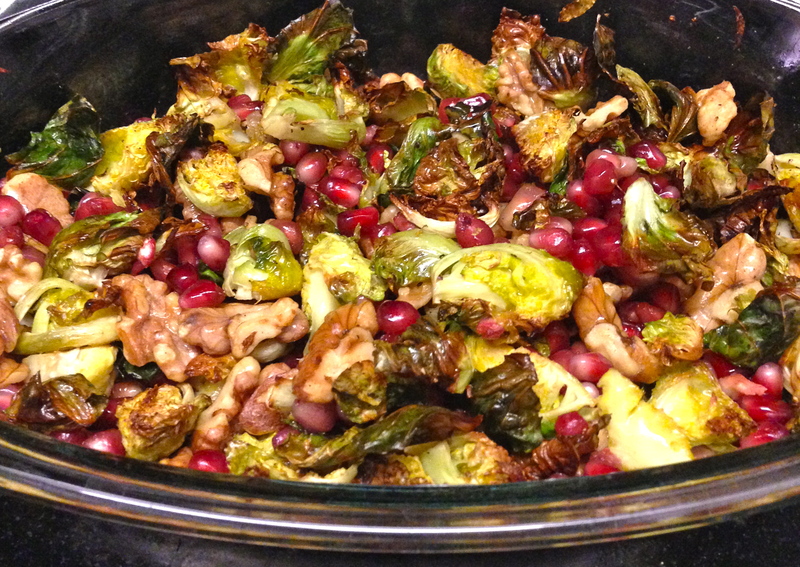 After 10 minutes, remove Brussels sprouts from oven and add walnuts. Stir Brussels sprouts and walnuts together and place back in oven. Bake another 10 minutes-15 minutes, until Brussels sprouts are slightly crispy on the outside. Stir occasionally. 5. 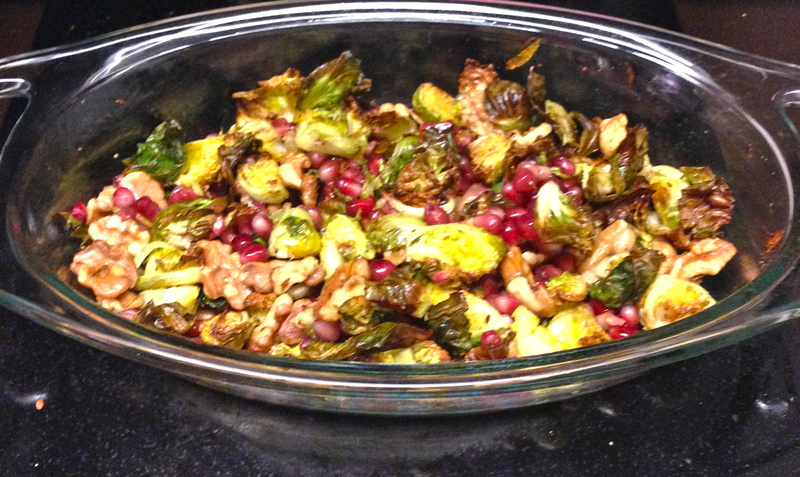 Remove Brussels sprouts from oven and add pomegranate arils. Mix all ingredients together and place back in oven. Bake another 5 minutes. Remove from oven and enjoy! This salmon salad will shake up your salad routine and get you excited for a plate full of veggies – and hearty salmon! Cabbage is a cruciferous vegetable and can grow in cool temperatures, so this salad is perfect for the fall and winter months, when vegetables can seem scarce. Plus, consuming at least two 6 oz portions of salmon per week supplies your weekly recommended amount of omega-3 fatty acids, which aid in reducing inflammation. Fresh ginger and a light drizzle of dressing spice up this salad and give it a distinct flavor that is anything but boring! 2. Spray casserole dish with cooking spray. Place salmon fillet in casserole dish. 3. Season salmon with spices (garlic powder, onion powder, ground black pepper and grated ginger). 4. Place salmon in oven. Bake 15-20 minutes, or until cooked through (reaching an internal temperature of 145 degrees Fahrenheit). 5. While salmon is in oven, chop cabbage. Place cabbage in strainer and rise. Dry thoroughly. Transfer cabbage to plate. 6. Skin, wash and dry carrot. Shred carrot over cabbage using a cheese grater. 7. Remove salmon from oven and let cool for 2-3 minutes. 8. 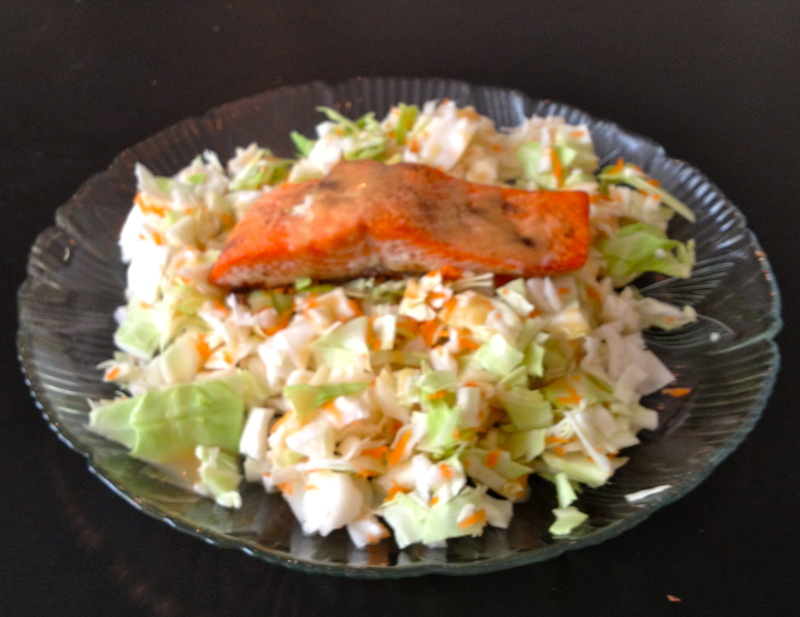 Place salmon on top of salad. Drizzle dressing over salad. Serve. *note: If you are concerned about your sodium intake, try to look for a low-sodium salad dressing. Also, you can make your own dressing using low-sodium soy sauce and mustard! Why order in greasy food when you can cook your own stir-fry with only ingredients you know are wholesome? This stir-fry can be made with any lean protein – I’ve replaced the tofu with shrimp before, as well as chicken, and it’s always been amazing and authentic tasting. Also, depending on which veggies I find at the farmer’s market or grocery stores, I’ve switched up the components of this dish to reflect seasonality and local offerings when possible. 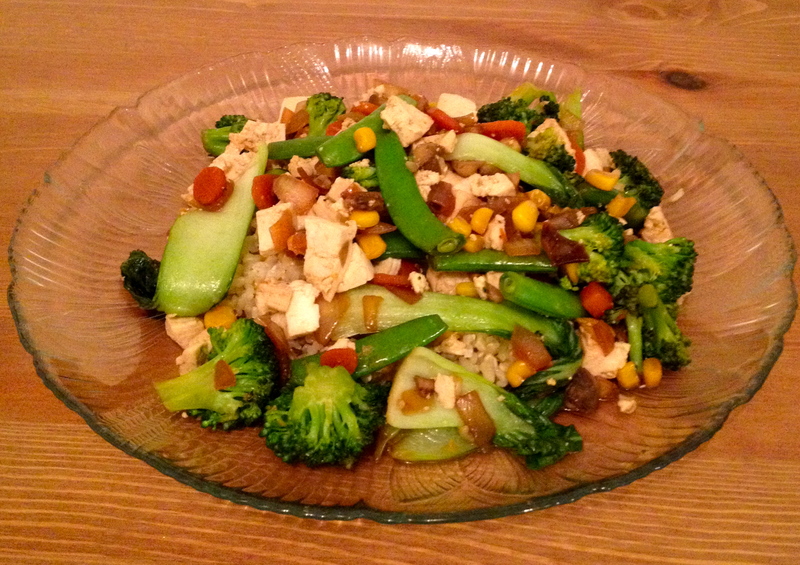 This healthy stir-fry will fill you up with fiber and protein and give you a hearty dose of antioxidants. Wok not included! This time I used baby corn! 1. Steam carrots in microwave until soft (approximately 5 minutes). 2. Steam broccoli florets in microwave for 1 minute and 30 seconds. 3. Steam corn in microwave for 45 seconds. 4. Cook brown rice according to directions on package (I find it easiest to buy fully cooked frozen brown rice and steam it in the microwave). 5. Drain excess water from tofu and gently squeeze dry with a paper towel. Cut into small cubes. 6. 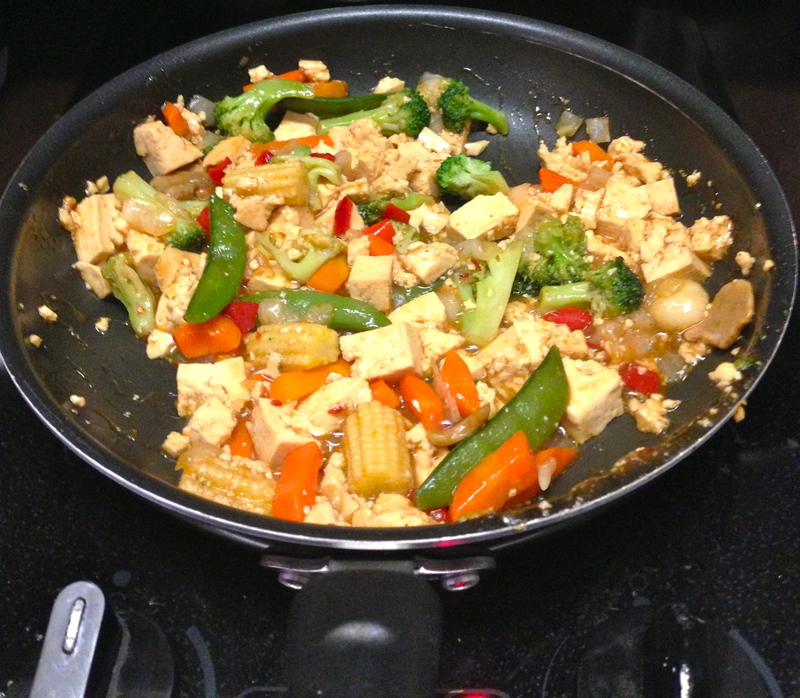 Pour oil and half the soy sauce (about 2 Tbsp) into skillet and warm over medium heat. 7. Place onion and mushrooms in skillet and cook for 5 minutes, stirring occasionally. 8. Slice bok choy into large pieces and add to skillet. 9. Wash sugar snap peas and pat dry. Add steamed carrots, corn and broccoli to skillet. Add tofu and sugar snap peas. Add remaining soy sauce and cook for another 5 minutes, stirring occasionally. 10. Place brown rice on plate and pour mixture over rice. Serve hot and enjoy!